In the beginning, the Lincoln Highway was more an idea than a highway. But it was a very powerful idea. On its dedication—Halloween, 1913—the towns and cities along the 3,300-mile route erupted in what the San Francisco Chronicle called“spontaneous expressions of gratification”—a wave of municipal celebrations animated by “the spirit of the great national boulevard.” The governor of Wyoming declared a day of “old-time jollification … and general rejoicing” that included, in a town called Rawlings, the erection of an enormous pyramid of wool. In Cedar Rapids, Iowa, residents enjoyed a festive shower of locally made Quaker Oats. Head on down the road with CityLab On The Road. 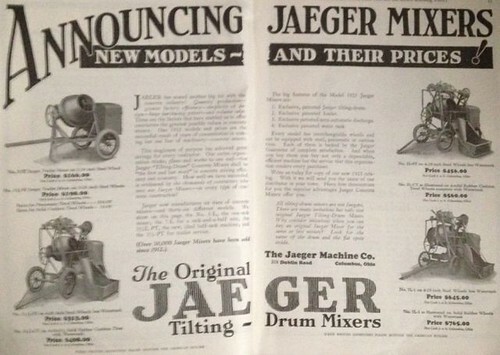 As we put the top down, we might spare a thought for Gebhard Jaeger; he died on this date in 1959. An inventor, engineer, and manufacturer, he designed and patented the first cement mixer in 1905, then went on to add other patents (including, in 1928, the mixer truck) and build a successful manufacturing company equipping the suppliers who served road builders and construction contractors through the road and building construction booms of the 20th century.